Well, the time wasn't right to give it. Mom was packing up a whole house to make a major move. Now, my parents are finally getting comfortable in their new home and it just seems like the right time to present the quilt as a sort of house warming gift. 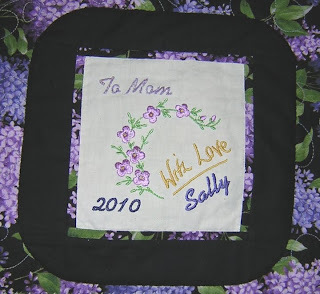 what a wonderful way to personalize a quilt ... note to self: get an embroidery machine next!! I just had a chance to play with a friend's Janome 200E (read that as a lesson to help her figure out the machine). It is just an embroidery machine with a 5x5 inch design area. It was a very nice machine and not very expensive. 5x5 would make very nice quilt labels.